Buy Jovees Sun Guard Cream SPF-20 - Sweat Proof, Moisturising Skin, Protects Skin, Provide Even Skin Tone, Nourishes Skin, Hydrates Skin. Enriched With Green Tea. Free Worldwide Shipping. 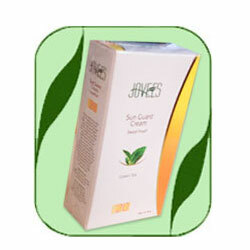 A daily moisturizing sweat proof Jovees Sun Guard Cream with SPF 20 has been scientifically developed, contains extracts of Green Tea, Calendula, Chamomile along with other plant based extracts that have been found to be sun protective, anti oxidant and anti-inflammatory. This cream not only protects skin from harmful UV-A and UV-B rays but also helps maintain essential hydration and nourishment for long. It will also help to keep skin even toned. Apply daily in the morning and evening all over face and neck and leave on. Green Tea, Peach ext, Chamomile, Calendula, Liquorice ext, Sandal ext, Micronized titanium dioxide, Ash of Zincum.